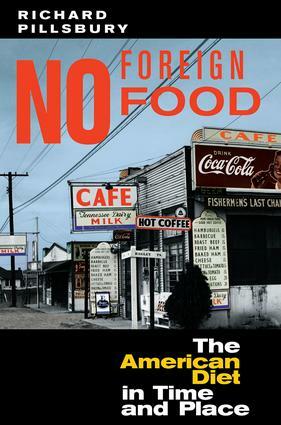 No Foreign Food explores the evolution and transformation of the American diet from colonial times to the present. How and why did our bland colonial diet evolve into today's restless m�nge of exotic foods? Why are Hoppin' Jon, lutefisk, and scrapple, once so important, seldom eaten today? How has the restaurant shaped our daily menus? These and hundreds of other questions are addressed in this examination of the changing American diet.Appropriately, Richard Pillsbury reviews the colonial American diet and its evolution from its Old World origins to the impact of the Industrial Revolution on food. He emphasizes the roles of transportation development and technological change, the rise of great food companies, the changing role of the food distribution system, the impact of changing immigration patterns, and the ways that cookbooks reflect and shape our foodways.The book concludes with an examination of America's contemporary cuisine. Noting current trends at home and in restaurants, Pillsbury reflects on the changing character of the new American diet, the growing nationalization and declining regionalization of what and how we eat, and a future where there is no foreign food.